In today’s post I want to bring your attention to this awesome free educational resource from Apple called Apple Teacher Learning Centre. This is an online platform designed specifically for teachers implementing Apple products in their instruction. 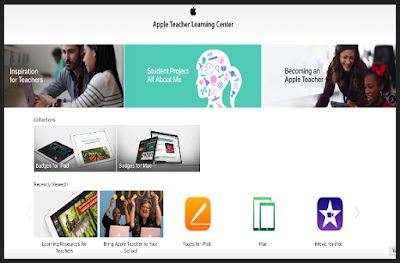 It provides a wide variety of resources, materials, lesson ideas and projects to help teachers make the best of Apple technology in education. However, you can benefit from this website even though you are not an Apple user as several of the learning activities, lesson tips and project ideas can be applied through the use of apps that are not necessarily Apple’s. Besides the iPad and Mac collections, you can also access a number of other interesting resource pages such as ‘Learning Resources for Teacher’, ‘Bring Apple Teacher to your School’, ‘Earning Swift Playgrounds Badges’, ‘Inspiration for Teachers’ and many more. Head over to Apple Teacher learning centre and give it a try.